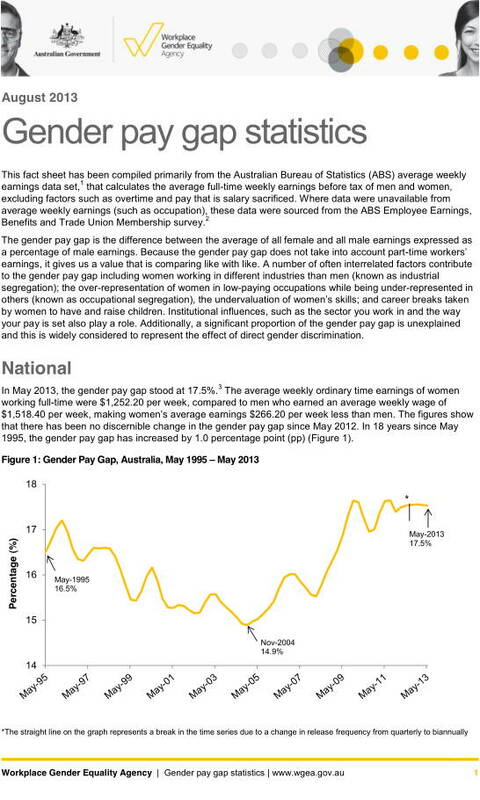 This gender pay fact sheet has been compiled primarily from the Australian Bureau of Statistics (ABS) average weekly earnings data set, that calculates the average full-time weekly earnings before tax of men and women, excluding factors such as overtime and pay that is salary sacrificed. Where data were unavailable from average weekly earnings (such as occupation), these data were sourced from the ABS Employee Earnings, Benefits and Trade Union Membership survey. The gender pay gap is the difference between the average of all female and all male earnings expressed as a percentage of male earnings. Because the gender pay gap does not take into account part-time workers earnings, it gives us a value that is comparing like with like. A number of often interrelated factors contribute to the gender pay gap including women working in different industries than men (known as industrial segregation); the over-representation of women in low-paying occupations while being under-represented in others (known as occupational segregation), the undervaluation of women’s skills; and career breaks taken by women to have and raise children. Posted in Asia Pacific, Economy, Federal, Financial Services, Local Industry, Primary Industry, Services Industry and tagged ABS, Australian Bureau of Statistics, average weekly earnings, Benefits and Trade Union Membership, earnings before tax, full-time weekly earnings, full-time workers, gender pay, gender pay gap, industrial segregation, occupational segregation, part-time workers, WGEA.